Seasons greetings from all of us at The Munir Group! We would like to express our deepest thanks to all of our clients, without whom we wouldn’t be where we are right now. Our number one source of business by far is from client referrals and repeat clients and we wanted to show each and every one of our clients just how much we appreciate them. So on Sunday, November 18th, 2018, we hosted our very first annual Munir Group Client Christmas Party at the Brantford Golf and Country Club and it was a smashing success! Having witnessed first hand the magical event I can say without a doubt that no expense was spared and no detail overlooked… thanks to Jen and Manny. 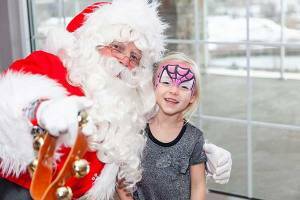 We had an amazing turnout with 245 guests, 120 of which were children. The stockings were hung on the chimney with care, in hopes that Saint Nicolas soon would be there. 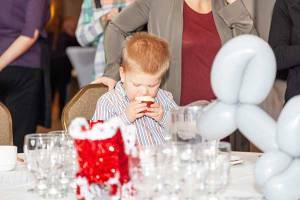 There was a stunning array of snacks and beverages geared to all ages. 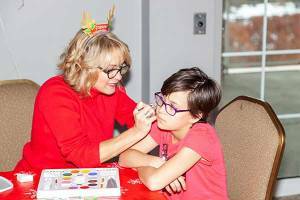 We would like to thank Nicole Martin from A Piece of Cake for doing such a wonderful job running the cookie decorating station which was a smash hit! Thanks to Tyler from Little Monsters Face Painting for lending us your phenomenal talent to paint many smiling little faces. 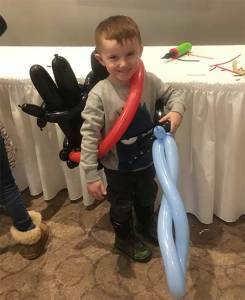 Thanks to Linda from Drew Ripley Entertainment who did not disappoint with her balloon animals, she accommodated every request, we saw lots of puppies on leashes, unicorns, rainbows and even a Ghost Buster ray pack! Thank you to the staff at the Brantford Golf and Country club that helped to keep the food and beverages coming and everything running seamlessly. And last but not least a great big thank you to the head elf himself, the big SC for stopping by and spending time with the kiddos and taking pictures with them. There were hand picked gifts for each and every child in attendance and several extravagant door prizes for the adults including a 55 inch TV, a PS4, a Scape Spa gift certificate and so much more. We have already booked the space again for next year and the planning has already commenced, that’s how excited we are for this party. How could we possibly top this? Jen has her work cut out for her. I can honestly say that I’ve never experienced a more fun, festive celebration before in my life. The best part of the party, we all agree, was being able to connect with our clients, give back to them, see how they were doing and wish them a very, very Merry Christmas.